Use ciprofloxacin ointment as directed by your doctor. Check the label on the medicine for exact dosing instructions. 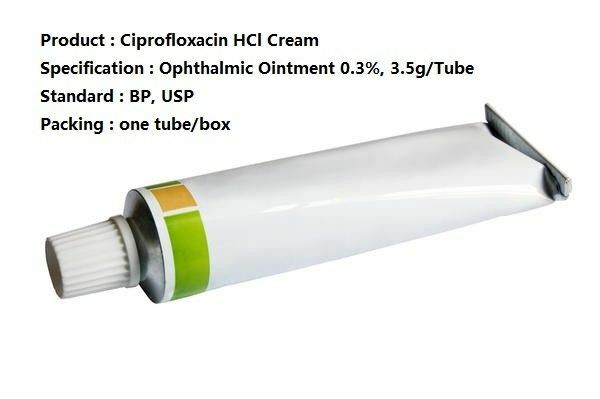 •Ciprofloxacin ointment may be used around the eye or in the eye. To use ciprofloxacin ointment in the eye, first, wash your hands. Using your index finger, pull the lower eyelid away from your eye to form a pouch. Squeeze a thin strip of ointment into the pouch. After using ciprofloxacin ointment, gently close your eyes for 1 to 2 minutes. Wash your hands to remove any medicine that may be on them. Wipe the applicator tip with a clean, dry tissue. •To prevent germs from contaminating your medicine, do not touch the applicator tip to any surface, including the eye. Keep the container tightly closed. •Do not wear contact lenses while you are using ciprofloxacin ointment. Take care of your contact lenses as directed by the manufacturer. Check with your doctor before you use them. •To clear up your infection completely, take/use ciprofloxacin ointment for the full course of treatment. Keep taking/using it even if you feel better in a few days. •If you miss a dose of ciprofloxacin ointment, use it as soon as possible. If it is almost time for your next dose, skip the missed dose and go back to your regular dosing schedule. Do not use 2 doses at once. Ask your health care provider any questions you may have about how to use ciprofloxacin ointment.